My first ever DSLR was the Nikon D40 which I purchased in January. Since then, I started my interest in the area of photography. Being a relatively middle income earner and knowing the exorbitant prices that revolves around this new hobby of mine, I faced a problem. The Nikon D40 didn’t have the autofocus motor built in the body. I guess this was Nikon’s way of reducing costs but it came as a problem for D40/D40x owners, they had to buy either Nikon’s AF-S type lenses or perhaps a cheaper alternative would be the Sigma HSM type lens. But, I am not here to talk about the D40 shortcomings. 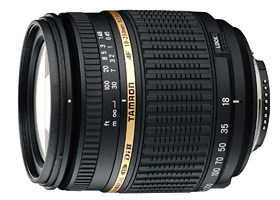 Tamron, another 3rd party lens maker has finally decided to jump onto that bandwagon to manufacture a lens capable of having the autofocus function with the Nikon D40. In any sense, this is a good business move by Tamron because they are catering for a large market (the D40 has a huge market because of its price worldwide) of consumers. With this in mind, I think Tamron has a winner provided that the price of this lens is priced well as it is definitely a good travel lens. It gives a nice wide 18mm as well as a long telephoto (compared against the usual 18-200mm lenses). Let’s see how this will fare against Sigma’s travel lenses. Back on the other spectrum of the price range would be something which many people have been waiting for, the Nikon D3. The first full frame DSLR for Nikon, the D3 marks an important milestone for Nikon and I am sure many people would be more than happy to jump on the new bandwagon. Well, if you are still clueless about the Nikon D3, don’t fret. Head over here to see how the D3 would look unboxed! Next postCan I celebrate also? Please? hi…I had one d40. um… thinking to upgrade the lens. um does it value to buy 3rd party lens or nikkor? are the functionings wise would be fully compatible with the d40 machine? Well if you are looking for the Nikkor lenses, make sure that you get the AF-S versions which has the built in motor on the lens so you can use the autofocus function with the D40. If third party, you can consider Sigma lenses which are the HSM types. These will enable you to have autofocus on the D40 as well.